This past winter, a man in a remote Siberian village near Omsk built a church completely out of snow. Aleksandr Bityokhin spent 45 days carving out his nearly 10 foot- (3 meter-) tall masterpiece, working for six weeks straight in temperatures that dropped below -30 Celsius (-22 Fahrenheit). There is no real church in the village, nor in any village nearby, so people who want to go to church have to drive to the city of Omsk, which is many kilometers away. The long drive is impossible for many villagers, especially for the sick and the elderly. The former construction worker, recently retired because he was diagnosed with a serious illness, decided to build a chapel, at least a temporary one, out of the most plentiful and cheapest material available to him. All he wanted was for the villagers of Sosnovka to have a place to celebrate Christmas and Epiphany properly. But soon enough, people from nearby villages also started trickling in. The villagers were so thrilled that they immediately started bringing icons from their houses to decorate the snow chapel. The chapel lasted until late spring. News of the snow church reached bishops, who commended Batyokhtin. People from nearby villages also started coming by to see his church. His work also drew attention to the lack of churches in Siberia. Hopefully, work on a real church will begin in the near future, a priest from the region said. 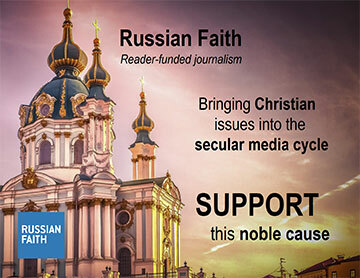 Irrational, perhaps, but one thing is certain: great is the faith of the Russians!